Dr. Steven Schargel will use the technique that is best for you. 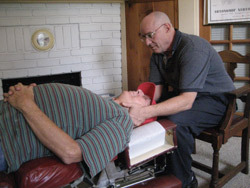 Dr. Steven Schargel adjusting a patient. If you’ve been to a chiropractor before and prefer to be adjusted in a particular way, let Dr. Steven Schargel know. We want you to relax, enjoy and fully benefit from your chiropractic care.